I love to make knitted Christmas ornaments with leftover yarn from other projects. 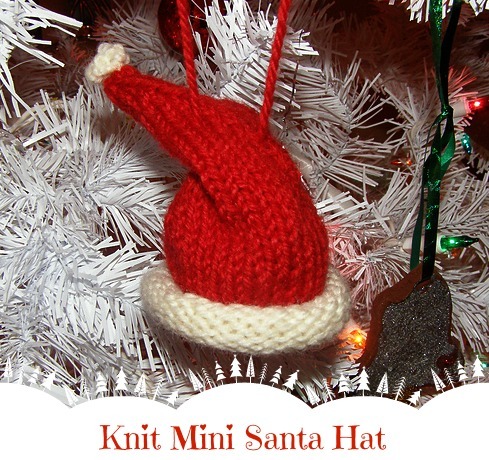 This knit mini Santa hat and knit Christmas tree ornament are quick and easy to make. The knitted Christmas ornaments can also be used to add a personal touch Christmas gift wrapping. Every year my friend hosts a Christmas Ornament Exchange party just a few days before Christmas. A few years ago I decided to knit an ornament instead of buying one and I've been making them ever since! Knitted Christmas ornaments are great ways to use up bits and pieces of yarn. 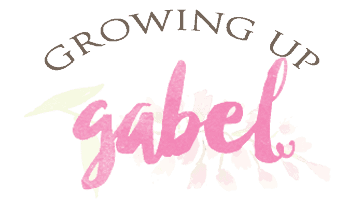 Everyone loves receiving them and they make beautiful decorations on gifts. I used this mini Santa hat ornament pattern to make this little guy. It's one of my favorites. Just use whatever red and white yarn scraps you have and any size needle. Or you could make different colored ones, too! 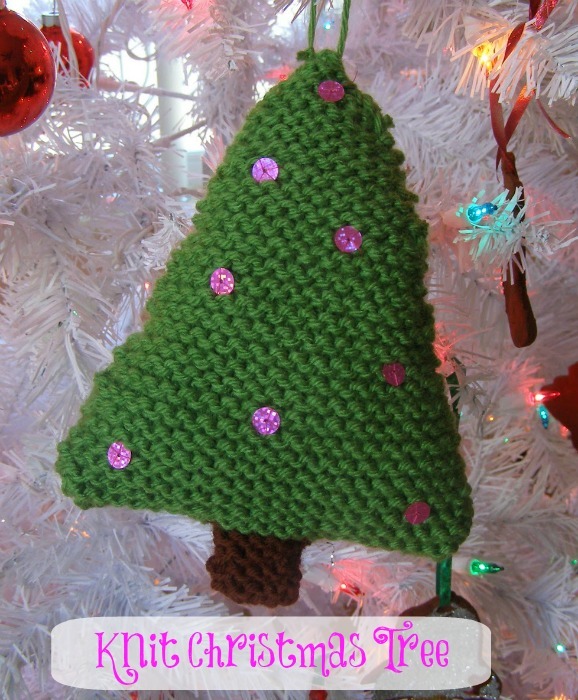 I really love this knit Christmas tree ornament pattern with all the sequins on it! You could use beads or any other little decorations you want to bling up this knit Christmas ornament. You just knit this one in garter stitch so it's really easy! Have done mini Santa hats for 3years, so easy and everyone loves them 🙂 I also use a bell for pom pom! Cute idea! I love those santa hats!! Do you have the pattern for Christmas hat? I love the pattern abiove for the Christmas Tree and am wondering if you downloaded it? 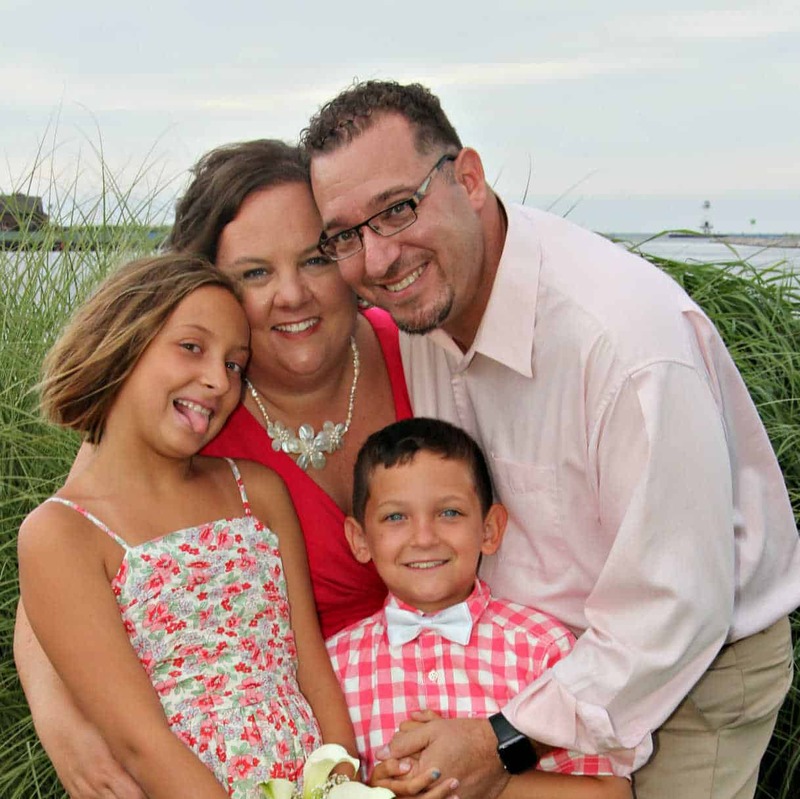 as the link doesn’t take me to the page/item…Hoping you can help me….